I want to thank you and your staff for all the hard work, lengthy paper preparation, and moreover the patience in dealing with the embassy – especially the latter considering what you conveyed to me in previous emails and in my own dealing with them. I know the embassy has not always been exactly “customer-friendly” so kudos to you all. I have no doubt that without your dedication, Ying would not have passed her interview and please forgive me if any of my previous correspondence was untoward – the stress on our relationship during this long period has been enormous, even to the point of affecting my health. Should you require me to write a recommendation for your company, please do not hesitate to ask and I would be more than happy to do so; I am also willingly to give my email address to any prospective client that you might have for reference purposes. 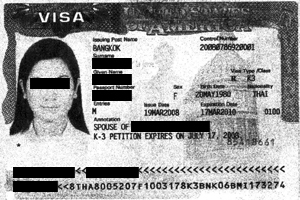 I know Ying has to go to Bangkok on Thursday to receive her visa stamp in her passport and if you could please let her have the birth certificates for herself, and 2 children (Mot and Mew) in English I would be duly grateful – I need these as you know for changing Ying’s status immediately she arrives. Are there any special forms besides the usual I94 and customs form, that Ying must fill in prior to entry into the states?